Home / Field Geeks / Football / NFL / NFC / NFCW / Arizona Cardinals / Bradford’s Last Hoorah? It’s safe to say that the Sam Bradford experiment has gone so poorly for the Cardinals that Valley sports fans should miss the days of the ‘Fernando Rodney Experience’. By now, everyone knows how historically anemic the Arizona Cardinals have been through the first two games of the 2018 season. Sure, the Cards are 0-2 for the first time since 2005, but it’s how they’ve gotten to 0-2 than just the record itself that has the fans and everyone else around the organization at a loss for words. The six points through two games is the lowest total for the Red Birds since 1945, when the Chicago Cardinals got shutout in their first two games of the season. If they get shutout against the Chicago Bears (1-1), the 2018 Cardinals will share the worst offensive point per game mark through three games in the franchises 99-year NFL existence with that World War ll era team at 2.0 ppg. Offensively, the current Cardinals rank dead last in the NFL in points per game, plays, rush attempts, longest run, pass yards, pass yards per attempt, pass TD’s, total yards, 1st downs, 3rd down conversions, 3rd down conversion percentage & time of possession. Entering Week-3, they are also second worst in penalties & rush yards. Defensively, Arizona ranks bottom ten in rushing and passing yards & total yards. They are also the second worst in getting off the field during 3rd downs at 50%, as opponents have converted half of their 28 attempts. Things have gone sideways so quickly that in an unheard of move, head coach Steve Wilks started piping in fan noise during practice this week. And no, not because the Bears are in town and he’s expecting their fans to take over the stadium – which in all likelihood will happen if the Cards fall behind early – Wilks piped in booing during practice, just in case the Sam Bradford led offense can’t get out of their own way for the third week in a row. Before delving back into the bad, there has been a couple bright spots. Per Pro Football Focus’ analytic grades, Larry Fitzgerald has graded out as the 18th best WR through two games, while Patrick Peterson ranks as the 9th overall CB & 7th in pass coverage, even though he has the second best passer rating allowed when the man he’s guarding is targeted. There’s also two backups who are filling in as starters due to injuries that are making their case for more playing times, even when said starters are healthy. Since replacing Andre Smith (elbow) during the first game of the season at right tackle, John Wetzel is tied for second in allowing QB pressures (1 pressure) in 70 pass blocking plays. He also has the second best grade on the whole offense, only trailing Fitzgerald. Filling in for an injured Olsen Pierre (toe; hasn’t played this season yet) & Markus Golden (ACL) on the defensive line, Benson Mayowa has been playing well enough to garner some attention. Mayowa recorded his first two sacks of the season on Sunday against the Rams and currently has 9 tackles through two games at left defensive end. For the first time since their major injuries last season, LDE Markus Golden and TE Jermaine Gresham (Achilles) were full participants during latter half of this weeks practice. Both Golden and Gresham are questionable against the Bears, as is Larry Fitzgerald (hamstring), but the assumption is that all will play. 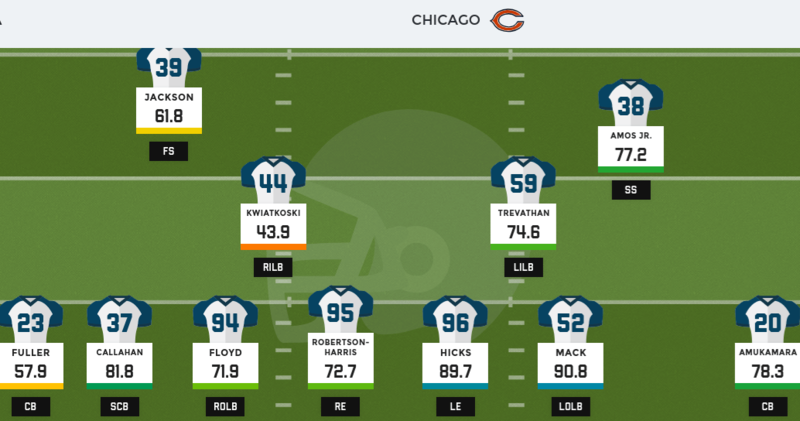 Olsen Pierre and Andre Smith are both ruled out, meaning Wetzel is going to have his hands full with the Bears’ Khalil Mack. Mack has a sack in each of the first two games and has the second highest ranked edge pass-rusher, with a grade of 90.8. New England’s Trey Flowers is at 90.9. While the offensive line has kept Bradford off the ground for the most part – 3 sacks (T-9); hit 11 times (T-16th) – there haven’t been very many holes opening for David Johnson to do much on the ground, even though the Cardinals are 14th in the league with a 4.1 avg/carry, as backed up by the longest run of the year being 11 yards. The grades through two games aren’t very pretty to say the least, for not just Sam Bradford, but the entire offense. The Cardinals are certainly going to have their hands full if they expect to come a way a winner for the first time in 2018. On the outside, Kirk and Fitz are the two receivers to catch a pass so far this year. 2nd-yr WR Chad Williams has yet to reel in any of his 6 targets and ranks 98th of 101 eligible receivers this season. 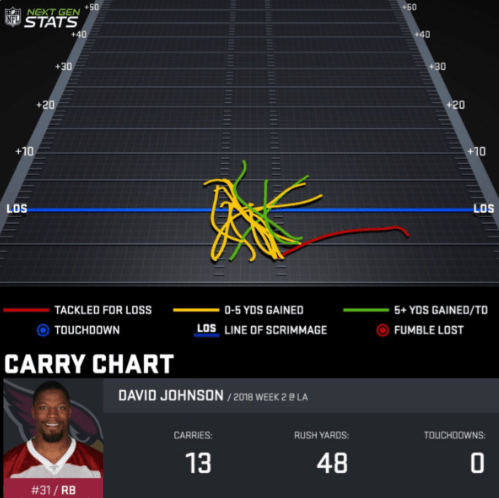 With David Johnson being ineffective and looking to have missed a couple assignments in pass blocking, he’s also seen his grade dip in this offense. Head coach Steve Wilks turned some heads early in the week when he said the offensive playbook will likely be ‘scaled back’ due to too many mistakes. It’s not just the fact that the offense is tied for last, with three other teams, on plays of 20+ yards (2X), or that they’re one of nine teams to not have a 40+ play thus far as too why Wilks’ comments were a head-scratcher, it’s also because of the usage of their star RB David Johnson. DJ caught 1 pass last week & is on pace to finish with 48 receptions, after coming off an 80 catch season in 2016. This David Johnson play tree from last week shows no innovation as offensive coordinator Mike McCoy has continuously called run plays between the tackles instead of trying to get David in open space where he’s most dangerous. While it might feel like the offense has enough of the blame to go around for the whole team, the defense which finished 6th in yards/game and 19th in PPG allowed, are currently 30th and 25th respectively. One reason being Jamar Taylor. After starting poorly last season, the defense clamped down and became a much better unit once Tramon Williams was inserted into the starting lineup around mid-season. The Cardinals better hope that Bene Benwikere can provide that same boost, because Jamar should be hanging onto the starting gig by a thread. Not only has he been penalized with four defensive holdings in two games, he also ranks 102nd of 103 eligible players by PFF. Taylor isn’t the only Cardinal defensive player though.The Cards have been playing a lot of three-safety sets (Baker, Bethea & Boston), even though Bethea is the highest rated of the three and he only has a grade of 61.6. 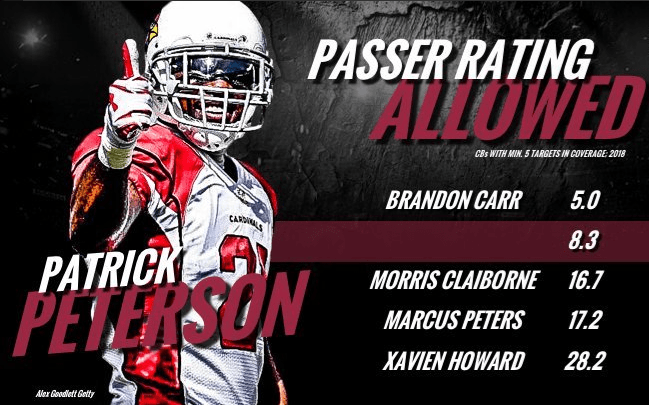 Even safety turned linebacker, Deone Bucannon, has seemingly lost his spot as a starter, as he played 25 snaps Sunday (35%). For good reason too, as Deone has been graded out as the 4th worst LB, 3rd worst against the run & 5th worst in coverage in the NFL. Haason Reddick, who seems to be in Wilks’ doghouse as well, played on only three defensive snaps against the Rams. While the 1st-round pick from a year ago has played only 17 snaps this season, he’s been graded out as the best defensive player on the team & would be ranked top-13 in the league in rush & coverage grades, as well as an overall grade if he had enough snaps under his belt. 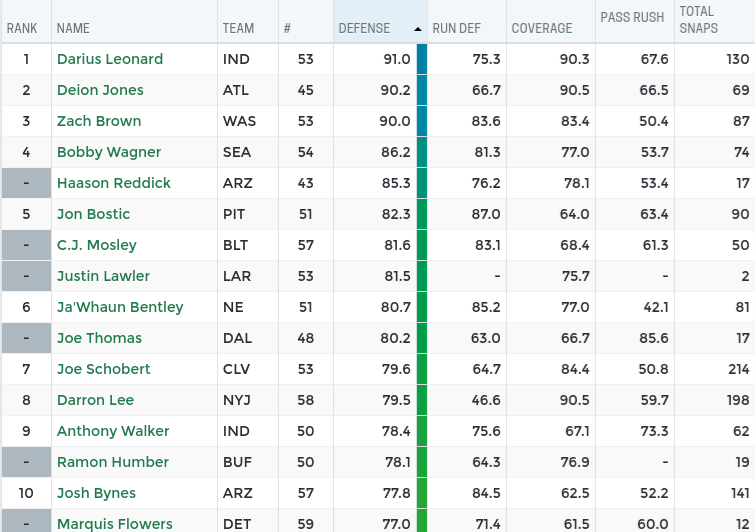 Josh Bynes also grades out as the 10th best overall linebacker thanks in large part to his 84.5 grade against the rush, which puts him at third in the league for that category. What Steve Wilks should’ve done instead of piping in boo’s during practice this week, was have “ROOOSSSEEENNN” chants filtering through the loud speakers. Because if the Cardinals drop to a third consecutive big first half deficit, and after fans watched Baker Mayfield come off the bench down 21-3 to lead the Cleveland Browns to their first win in nearly two seasons on Thursday, everyone in attendance will surely be waiting for the first opportunity to let their voices be heard. After all, inserting the 10th overall pick in this years draft can’t break this offense anymore than it already is.